Apologies in advance if this is a dumb noob question asked many times before. The 3D mode on the FreeCiv web version looks awesome yet I cannot find anything about installing it for the regular offline desktop version? Is it even possible? If so can someone point me in the right direction? Blake's Sanctum: Retro site for retro games! Civ, MoM, C&C, Dune, HoMM, B5, Star Trek, Doom, TES & more! Re: Desktop FreeCiv in 3D? It is exclusively web version. I think it may be possible to install the server locally, but you'd have to compile it from scratch. Probably adjust stuff in the code. I'm not a programmer, but that is my impression. I know I wouldn't be able to do it IF it is even possible. Corbeau wrote: It is exclusively web version. I think it may be possible to install the server locally, but you'd have to compile it from scratch. Probably adjust stuff in the code. I'm not a programmer, but that is my impression. I know I wouldn't be able to do it IF it is even possible. Thank you for your reply, yeah I'm not a programmer either. 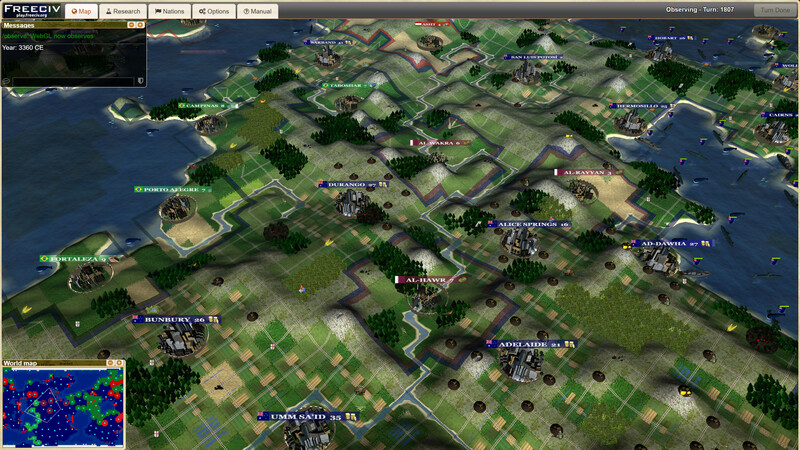 I've done a few graphics mods and scenarios for the early 2D Civ games but I've never messed with Freeciv! That's a shame as the web version of FreeCiv doesn't have a guaranteed future (like all online server based games) whereas a mod for the offline desktop version can be preserved by fans and never be lost! The 3D mod is quite stunning! I was just watching a video on youtube of someone playing it and its filled with unhappy comments from people complaining about servers being down etc. The problem I see here is that a huge quantity of people who would be interested in this kind of game are simply not informed of the all incarnations readily available right now. Getting it to run in your own PC should not be very difficult. If you have a powerful machine it may be enough to install vagrant and virtualbox, clone or download the repo, run `vagrant up`, wait (a lot) for the installation in the VM to finish and, if everything goes well, point your browser to http://localhost or http://localhost:8080. If something goes wrong, the easy part is gone. I don't really know. I've not touched the WebGL part, and I don't have the required knowledge. The main difficulty is that different tilesets would need to be supported. The JS implementation is also far from optimal and will be slow on large maps or weak systems. I consider it more as a proof-of-concept than production-ready code.